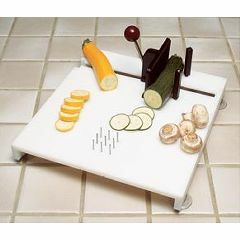 This adaptable Swedish Cutting Board can be used to slice and grate food or hold mixing and salad bowls. Designed for one-handed use, with stainless steel spikes and a vise for holding food and objects. The vise can be used to hold jars while opening lids. Rubber suction feet secure the board to surfaces. White plastic board measures 12" x 11" (30 x 28cm). Weighs 3 lbs. (1.3kg). Clean with dish soap and water. Stabilizing food . Suction cups. Board won't slide. Washable. Pins hold produce. Pin holder may break. Sliding holder may break. Locking cam on slide. may break. Cutting or slicing food. Holds pots. Stroke survivor. Paralyzed left hand. I use board to hold produce, bread, and meat while slicing. I owned an older model. The cam lock on the sliding adjustable stabilizer broke. The newer model has a stronger cam; no problems to date. Wish i&acirc;&#128;&#153;d Have Found This Sooner! Quality product . Quality product . Quality product .